Google just released a new extension for Chrome that will help refine your search engine results even further than the normal Google experience. The new extension comes as a response to users requesting action taken against websites that can be labeled as “content farms.” After taking the plugin for a test drive, it seems to let you do just that. Let’s block some poor Google results from showing up in Chrome! 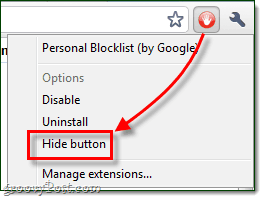 Download the Personal Blocklist Chrome extension from Google. When you see a Google search result that goes to a useless spam site you can now Click a Block link below the result. Once you block a site, it will never show up in your Google search results ever again. Additionally, Google will take a note that you blocked the website and will use this information to filter out spam sites even more efficiently. Now you have total control over what sites show up in your search results. Even if there is a site that you don’t like in particular, you can block it from ever showing up in your results. That was easy eh? Go hence forth and block spam search engine results with great gusto! On another note, if you want to unblock a website just Click the Red Stop button that now shows up to the right of your address bar (right next to the tools menu wrench). But hey, speaking of the red button, it is rather unsightly – but you can hide it! To hide the Personal Blocklist extensions red button, just Right-Click the button and then Select Hide button from the menu. If at some point you want to change settings to Personal Blocklist or restore the red button, Click the Wrench and Select Tools > Extensions. 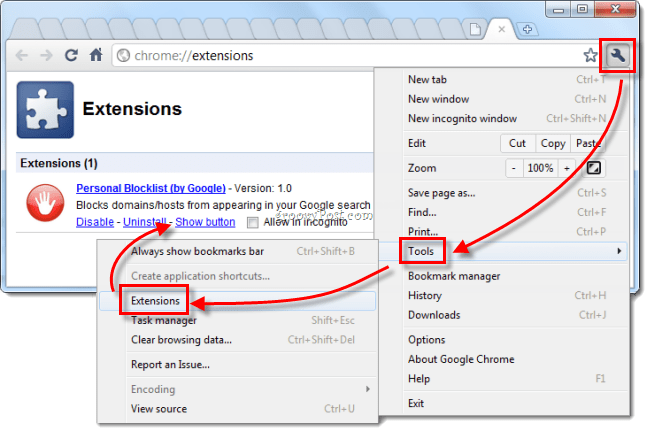 A new chrome://extensions tab should open, here you can choose to show the red button again or even remove the extension. I knew it! I’ve been hoping that Google would find a way to nerf those content farms. And this is a great way to do it without being accused of arbitrarily targeting specific websites. When you choose to block or unblock a pattern, the extension will also transmit to Google the URL of the web page on which the blocked or unblocked search results are displayed. You agree that Google may freely use this information to improve our products and services. So, if we all start blocking god awful eHow articles, then Google will have PROOF that people don’t want to read that crap. Exceedingly useful bless you, I presume your trusty audience would certainly want a great deal more items similar to this maintain the good hard work. Doesn’t work no matter if you are signed in or not.